Mark Waid (/weɪd/; born March 21, 1962) is an American comic book writer, known for his work on titles for DC Comics such as The Flash, Kingdom Come and Superman: Birthright, and for his work on Captain America, Fantastic Four, and Daredevil for Marvel Comics. From August 2007 to December 2010, Waid served as Editor-in-Chief, and later, Chief Creative Officer of Boom! Studios, where he wrote titles such as Irredeemable, Incorruptible, and The Traveler. Waid was born in Hueytown, Alabama. He has stated that his comics work was heavily influenced by Adventure Comics #369–370 (1968), the two-part "Legion of Super-Heroes" story by Jim Shooter and Mort Weisinger that introduced the villain Mordru, was "a blueprint for everything I write." Waid entered the comics field during the mid-1980s as an editor and writer on Fantagraphics Books' comic book fan magazine, Amazing Heroes. Waid's first comic book story "The Puzzle of the Purloined Fortress", an eight-page Superman story, was published in Action Comics #572 (Oct. 1985). 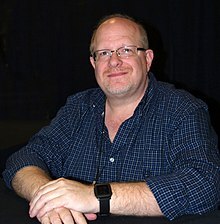 In 1987, Waid was hired as an editor for DC Comics where he worked on such titles as Action Comics, Doom Patrol, Infinity, Inc., Legion of Super-Heroes, Secret Origins, and Wonder Woman, as well as various one-shots including Batman: Gotham by Gaslight. With Gotham by Gaslight, and in tandem with writer Brian Augustyn, Waid co-created DC's "Elseworlds" franchise. In 1989 Waid left editorial work for freelance writing assignments. He worked for DC's short-lived Impact Comics line where he wrote The Comet and scripted dialogue for Legend of the Shield. In 1992 Waid began the assignment which would bring him to wider recognition in the comics industry, when he was hired to write The Flash by editor Brian Augustyn. Waid stayed on the title for an eight-year run. He wrote a Metamorpho limited series in 1993 and created the Impulse character in The Flash #92 (July 1994). Impulse was launched into his own series in April 1995 by Waid and artist Humberto Ramos. In November of that same year, Waid and Howard Porter collaborated on the Underworld Unleashed limited series, which served as the center of a company-wide crossover storyline. His first major project for Marvel Comics was as one of the writers of the "Age of Apocalypse" crossover. He later co-created the Onslaught character for the X-Men line. Marvel editors Ralph Macchio and Mark Gruenwald hired him as Gruenwald's successor as writer of Captain America, during which Waid was paired with artist Ron Garney. Waid and Garney garnered critical praise for their run on the title, remaining on it until the title was relaunched with a different creative team as part of the 1996–1997 "Heroes Reborn" storyline. Rob Liefeld offered Waid the opportunity to script Captain America over plots and artwork by his studio, but Waid declined. That storyline ran a full year, after which Waid and Garney returned to the title for another relaunched series, Captain America volume 3, issues #1–23. Waid also wrote the short-lived spin-off series Captain America: Sentinel of Liberty from 1998–1999, having written 10 of the 12 issues (skipping issues #7 and 10). In 1996, Waid and artist Alex Ross produced the graphic novel Kingdom Come. This story, set in the future of the DC Universe, depicted the fate of Superman, Batman, Wonder Woman, and other heroes as the world around them changed. It was written in reaction to the "grim and gritty" comics of the 1980s and 1990s. DC Comics writer and executive Paul Levitz observed that "Waid's deep knowledge of the heroes' pasts served them well, and Ross' unique painted art style made a powerful statement about the reality of the world they built." Many of the ideas introduced in Kingdom Come were later integrated into the present-day DC Universe, and Waid himself wrote a follow-up to the series, The Kingdom. Waid and writer Grant Morrison collaborated on a number of projects that would successfully reestablish DC's Justice League to prominence. Waid's contributions included JLA: Year One, as well as work on the ongoing series. The two writers developed the concept of Hypertime to explain problems with continuity in the DC Universe. Waid collaborated with artists Bryan Hitch and Paul Neary on JLA and the JLA: Heaven's Ladder (Oct. 2000) one-shot. In 2000, Waid wrote a series named Empire with Barry Kitson, whose protagonist was a Doctor Doom-like supervillain named Golgoth who had defeated all superheroes and conquered the world. The series was originally published by Gorilla Comics, a company formed by Waid, Kurt Busiek and several others, but the company folded after only two issues were published. Empire was completed under the DC Comics label in 2003 and 2004. Waid wrote the first year of Crossgen's Ruse series. Waid began an acclaimed run as writer of Marvel's Fantastic Four in 2002 with his former Flash artist Mike Wieringo, with Marvel releasing their debut issue, Fantastic Four vol. 3 #60 (Oct. 2002) at the promotional price of 9 cents U.S. By June 2003, Marvel publisher Bill Jemas tried to convince Waid to abandon his "high-adventure" approach to the series, and making the book into, in Waid's words, "a wacky suburban dramedy where Reed's a nutty professor who creates amazing but impractical inventions, Sue's the office-temp breadwinner, the cranky neighbor is their new 'arch-enemy,' etc." Waid, who felt that this was too much of a departure from what he had been hired to write, initially declined. After some discussion with editor Tom Brevoort, Waid found a way to make the requested changes, but by then, the decision had been made to fire Waid and Wieringo from the series. The resulting fan backlash led to Waid and Wieringo's reinstatement on the title by that September. Waid and Wieringo completed their run on Fantastic Four with issue #524 (May 2005), by which time the previously relaunched series had returned to its original numbering. In 2003 Waid wrote the origin of the "modern" Superman with Superman: Birthright, a twelve-part limited series which was meant to be the new official origin story of the Man of Steel. Birthright contained several characters and elements from the Silver and Modern Age Superman comic books and homages to Superman: The Movie and the Smallville television series. Waid returned to writing Legion of Super-Heroes in December 2004, teaming again with Barry Kitson. He finished his run on the series with issue #30 (July 2007). 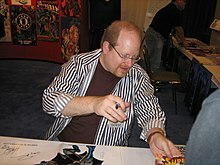 In 2005, Waid signed a two-year exclusive contract with DC Comics. He co-wrote the 52 limited series with Grant Morrison, Geoff Johns, Greg Rucka, and Keith Giffen that lasted for one year and covered the events that take place during the year in the DC Universe following Infinite Crisis. Another project for DC was a new launch of The Brave and the Bold with artist George Pérez, and a brief return to The Flash. On July 27, 2007, at the San Diego Comic-Con International, Boom! Studios announced that Waid would join Boom! as Editor-in-Chief the following month. As his non-creator assignments at DC lapsed, he stated that all his future creator-owned work will be with Boom!. Waid was promoted to Chief Creative Officer of BOOM! Studios in August 2010. That December, Waid announced he would be leaving that role, and return to freelance work, though he would continue writing for the publisher. In the late 2000s Waid worked on the Spider-Man creative team, writing several issues of The Amazing Spider-Man, including a meeting between Spider-Man and Stephen Colbert in The Amazing Spider-Man #573 (Dec. 2008). Waid scripted the opening of "The Gauntlet" storyline in issue #612 (Jan. 2010). Waid wrote the Doctor Strange mini-series Strange, and several series for Boom! Studios, notably Irredeemable with artist Peter Krause and its spinoff Incorruptible. In July 2011 Marvel relaunched a monthly Daredevil series with Waid on writing duties. Waid and artist Paolo Rivera garnered positive reviews for their work on the title, and earned multiple 2012 Eisner Awards, including Best Continuing Series and Best Single Issue for issue #7. In addition, Waid won Best Writer for his work on Daredevil, as well as his work on Irredeemable, and Incorruptible. Waid received a "Best Writer" Harvey Award as well for his Daredevil work. In November 2012, Waid and artist Leinil Francis Yu launched The Indestructible Hulk series for Marvel. In 2011 Waid established a free digital comics website Thrillbent, launching the site with the title Insufferable. An essay posted on October 2, 2013 by Waid, titled "An Open Letter To Young Freelancers", generated attention within the comics industry with The Hollywood Reporter describing it as "an important commentary on business practices that are in a state of flux at publishers both large and small." In 2014, Waid launched new series for Daredevil and The Hulk with artists Chris Samnee and Mark Bagley respectively. In December 2014, Waid's S.H.I.E.L.D. title began and it introduced several characters from the television series Agents of S.H.I.E.L.D. into the Marvel comics universe. He later wrote All-New, All-Different Avengers, Black Widow, and The Avengers. Waid and artist J. G. Jones produced Strange Fruit for Boom! Studios in July 2015. In 2016, Waid and artist Humberto Ramos co-created The Champions for Marvel. The following year, Waid returned to the Captain America series beginning with issue #695 working with artist Chris Samnee. A new Doctor Strange series was launched by Waid and Jesus Saiz in 2018. On April 9, 2019, Marvel announced that Waid would write a five-issue miniseries featuring the Invisible Woman, her first solo series since her debut in 1961. In September 2018 writer Richard Meyer, the creator of the YouTube channel Diversity & Comics, filed a civil lawsuit in Texas against Waid, claiming defamation and tortious interference on Waid's part. Meyer accused Waid of convincing Antarctic Press not to publish Meyer’s graphic novel Jawbreakers. Waid, who launched a GoFundMe campaign to raise money to fight the suit, denied having anything to do with Antarctic Press' decision, which his lawyers state was prompted by Meyer's own actions. Waid's fellow comics creators Neil Gaiman, Kurt Busiek, Dan Slott and Yanick Paquette contributed to his campaign, while artist Ethan Van Sciver began a similar campaign for Meyer. ^ Ryall, Chris; Tipton, Scott (2009). Comic Books 101: The History, Methods and Madness. Impact. ISBN 1600611877. ^ Ellis, Warren (September 29, 2000). "Come In Alone: Issue #44". CBR.com. Archived from the original on September 30, 2013. ^ a b c "Mark Waid biography". The Brave and the Bold: The Lords of Luck. DC Comics. 2007. ISBN 1401215033. ^ a b Cronin, Brian (March 12, 2011). "Mark Waid's Back Pages". CBR.com. Archived from the original on April 14, 2011. ^ Irving, Christopher (Fall 2013). "The Wild Ride of Writer Mark Waid". Comic Book Creator. Raleigh, North Carolina: TwoMorrows Publishing (3): 22–27. ^ Manning "1990s" in Dolan, p. 265: "The brainchild of writer Mark Waid and artist Mike Wieringo, Impulse burst onto the scene at quite a pace." ^ Manning "1990s" in Dolan, p. 271: "The villains of the [DC Universe] underwent their own extreme makeovers in Underworld Unleashed, a three-issue miniseries by writer Mark Waid and artist Howard Porter." ^ Manning "1990s" in Gilbert (2008), p. 279: "First appearing in this issue [X-Men #53] by writer Mark Waid with pencils by Andy Kubert, Onslaught's emergence would spell doom for many of the Marvel heroes"
^ a b c d Cronin, Brian (May 30, 2010). "The Greatest Mark Waid Stories Ever Told!". CBR.com. Archived from the original on August 20, 2013. ^ Phegley, Kiel (July 11, 2011). "Reviving Mark Waid's Red Skull". CBR.com. Archived from the original on June 16, 2012. ^ a b Senreich, Matthew (August 1997). "The Wizard Q&A: Mark Waid & Ron Garney". Wizard (72). pp. 68–72. ^ Manning "1990s" in Gilbert (2008), p. 288: "Writer Mark Waid began what many fans still consider to be the ultimate run on the Captain America title with this series penciled by Ron Garney." ^ Manning "1990s" in Dolan, p. 273: Under the limitless possibilities of DC's Elseworlds label, Ross and Waid crafted a tale of biblical proportions." ^ Manning "1990s" in Dolan, p. 286: "Writer Mark Waid returned to the kingdom he helped envision with this series of specials designed as a sequel to the hit miniseries Kingdom Come." ^ Manning "1990s" in Dolan, p. 282: "It was up to writers Mark Waid and Brian Augustyn and artist Barry Kitson to fill in the blanks. With their twelve-issue maxiseries JLA: Year One, the trio examined the early days of the team...JLA: Year One proved a success, and cleaned up decades of convoluted comic history." ^ Cowsill, Alan "2000s" in Dolan, p. 297: "Artist Bryan Hitch made full use of the book's extra-large format... Written by Mark Waid, Heaven's Ladder dealt with religion and the afterlife." ^ Dean, Michael (June 8, 2001). "The Case of the Disappearing Gorilla: The Banana Trust Explains How Not to Start a Comics Line". The Comics Journal #234. Seattle, Washington: Fantagraphics Books. Archived from the original on March 4, 2012. Retrieved March 4, 2012. ^ Ching, Albert (March 14, 2011). "Mark Waid Talks Returning to Ruse After 10 Years". Newsarama. Archived from the original on March 3, 2016. ^ Ching, Albert (August 12, 2010). "'G-Day': Comic Book Industry Remembers Gruenwald and Wieringo". Newsarama. Archived from the original on March 24, 2012. ^ Weiland, Jonah (June 16, 2003). "Waid fired, off Fantastic Four, Marvel EIC Quesada responds". CBR.com. Archived from the original on June 21, 2013. ^ Singh, Arune (September 25, 2003). "World's Greatest Again: Waid & 'Ringo back on Fantastic Four". CBR.com. Archived from the original on October 17, 2013. ^ Weiland, Jonah (September 29, 2003). "Marvel makes it official, Waid/Wieringo back on FF, new Marvel Knights book launched". CBR.com. Archived from the original on October 17, 2013. ^ Cowsill "2000s" in Dolan, p. 310: "Superman's post-Crisis on Infinite Earths origin had remained lore since John Byrne's seminal Man of Steel series in 1986, but by 2003 it was time for an update." ^ Cowsill "2000s" in Dolan, p. 318: "Top writer Mark Waid and artist Barry Kitson joined forces to relaunch one of DC's best-loved super-teams." ^ Cowsill "2000s" in Dolan, p. 329: "Writer Mark Waid and artist George Pérez teamed up to relaunch one of DC's best-loved titles, The Brave and the Bold." ^ Weiland, Jonah (July 27, 2007). "CCI: Mark Waid Named EiC of Boom! Studios". CBR.com. Archived from the original on October 23, 2012. ^ Weiland, Jonah (December 9, 2010). "Waid Leaves Boom! as CCO, Returns to Freelancing". CBR.com. Archived from the original on October 13, 2013. ^ "Mark Waid Steps Down as Boom! CCO, Returns to Freelance". Newsarama. December 9, 2010. Archived from the original on October 16, 2013. ^ Cowsill "2010s" in Gilbert (2012), p. 327: "Written by Mark Waid and drawn by Paul Azaceta, the two-part opening mixed the real-world drama of the economic meltdown with some Spidey action." ^ Richards, Dave (June 20, 2009). "HeroesCon: Waid Talks Strange". CBR.com. Archived from the original on August 17, 2013. Retrieved January 22, 2010. ^ Rogers, Vaneta (June 20, 2009). "Mark Waid Gets Strange For Marvel This Fall". Newsarama. Archived from the original on October 15, 2013. Retrieved January 22, 2010. ^ Richards, Dave (November 4, 2009). "Mark Waid Gets Strange". CBR.com. Archived from the original on June 21, 2013. Retrieved January 22, 2010. ^ Ching, Albert (March 20, 2011). "Mark Waid on a Daredevil That 'Won't Drive You to Drink'". Newsarama. Archived from the original on October 15, 2013. ^ Dickinson, Brock (October 9, 2012). "Thrill Of The Hunt – Mark Waid's Daredevil #2". Bleeding Cool. Archived from the original on October 11, 2012. ^ Hoare, James (August 12, 2012). "Why aren't you reading Mark Waid and Paolo Rivera's Daredevil?". SciFiNow. Archived from the original on October 15, 2013. ^ "Full List of 2012 Eisner Award Winners". Newsarama. July 14, 2012. Archived from the original on October 15, 2013. ^ Wright, Eddie (September 10, 2012). "Mark Waid, Paolo Rivera And Joe Rivera Talk Their Harvey Award Wins For Daredevil". MTV. Archived from the original on January 24, 2013. Retrieved October 16, 2013. ^ Ching, Albert (August 21, 2012). "Mark Waid Charts New Territory for Indestructible Hulk". Newsarama. Archived from the original on October 17, 2013. ^ Tabrys, Jason (May 28, 2014). "Mark Waid Talks Thrillbent, Empire, Daredevil, and More". Den of Geek! ^ Waid, Mark (October 2, 2013). "An Open Letter To Young Freelancers". Trillbent.com. Archived from the original on October 6, 2013. ^ Johnston, Rich (October 3, 2013). "Comics Industry Reacts To… Mark Waid's Anti-Bullying Call". Bleeding Cool. Archived from the original on October 14, 2013. Yesterday, Mark Waid wrote a clarion call for comic book creators, warning of the dangers of being too submissive in the face of editorial dictat. It had quite the reaction. ^ Melrose, Kevin (October 2, 2013). "Quote of the Day Mark Waid's advice to young freelancers". CBR.com. Archived from the original on October 2, 2013. Mark Waid, from a lengthy 'Open Letter to Young Freelancers' that’s a must-read not only for comics creators — of any age, and at any stage in their careers — but also for freelancers in other fields, to say nothing of editors, publishers and consumers. ^ McMillan, Graeme (October 2, 2013). "Mark Waid Advises New Creators 'Quality of Work Is All That Matters'". The Hollywood Reporter. Archived from the original on January 4, 2014. ^ Wheeler, Andrew (July 24, 2014). "Marvel Announces Mark Waid's S.H.I.E.L.D. And More At Next Big Thing Panel". Comics Alliance. Archived from the original on March 22, 2015. Retrieved January 1, 2015. ^ Richards, Dave (July 6, 2018). "Doctor Strange Enters the Infinity Wars (With Some Help From Mark Waid)". CBR.com. Archived from the original on September 6, 2018. ^ "INVISIBLE WOMAN Reunites with MARK WAID For New Title". Newsarama. April 9, 2019. Retrieved April 10, 2019. ^ Johnston, Rich (29 September 2018). "Richard Meyer Sues Mark Waid Over 'Tortious Interference With Contract and Defamation'". Bleeding Cool. Archived from the original on 9 April 2019. ^ Johnston, Rich (3 November 2018). "Mark Waid Legal Response to Richard Meyer's Defamation and Tortious Interference Lawsuit". Bleeding Cool. Archived from the original on 4 November 2018. 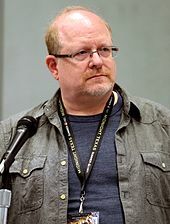 Wikimedia Commons has media related to Mark Waid.